In December of 2015, reknowned coach Twahir Muhiddin steered Bandari FC of Mombasa to winning the 2015 GoTV shield, thus earning the right to represent Kenya in the 2016 Confederations cup. On their way to winning the cup, Bandari eliminated other fancied top tier sides including Ulinzi FC and Muhoroni Youth who had gone 11 matches unbeaten in the second leg of the Kenya Premier League. It is a significant achievement for Muhiddin and Bandari considering that thetournament also featured traditionally strong sides including Gor Mahia, AFC Leopards, Tusker, Sofapaka and others. Aside from the GoTV shield win, Muhiddin steered his charges toa respectable fourth position in the Kenya Premier League, a feat that saw them finish ahead of Tusker and AFC Leopards. His achievements in 2015 are only the latest in a string of superlative achievements by coach Muhiddin who has been in and around Kenya football since the late 1980s when he was assistant Harambee stars coach, working with the then head coach Mohamed Kheri who also turned out to be one of the best coaches this country has ever produced. Muhiddin’s record of superlative achievements goes back to 1997 when he was in charge of Utalii FC. At the time he led the unfancied side to the Kenya national league title. It was an unprecedented and surprising win. Utalii had been promoted to the top tier only a few years earlier. And prior to that the national league titles had mostly been won by Gor Mahia, AFC Leopards and Tusker. Utalii’s league title in 1997 is still one of the most surprising league wins. Three years later, following the disbandment of Utalii, Muhiddin was now at Oserian Fastac of Naivasha. In 2000, he took Oserian to the brink of winning the national league title. They finished only two points behind the eventual winners Tusker in the playoffs. The following league season (2001), he steered Oserian to their maiden league title. With a total of 88 points from 38 matches, they finished a good seven points ahead of second placed Mathare. Oserian also scored an incredible 73 goals which was 18 more than the next best team. In January 2001, Oserian played in the CECAFA club cup alongside Tusker. As hosts, Kenya were entitled to field two teams. Oserian under Muhiddin topped group B by winning all three matches. They beat Red Sea 3-0 of Somalia 3-0, beat APR of Rwanda 2-0 and SC Villa of Uganda 3-0. In the semis, they beat St George of Ethiopia on penalties, before losing to compatriots Tusker on penalties. in the final. In 1998, Utalii as Kenya champions, represented the country in the 1998 Africa champions cup. With Muhiddin as coach, they dispatched Mdlaw Megbi of Eritrea 2-0 on aggregate score. 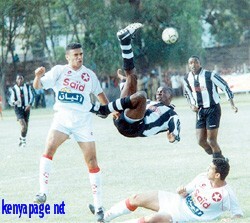 In the first round, they faced Sudanese giants El Merreikh. They won the opening leg 4-0 and lost the return leg 3-0. They thus progressed on 4-3 aggregate win. In the second round, they faced Tunisian champions Etoile du Sahel. After winning the opening leg 1-0, many counted Utalii out, expecting a whitewash in the return leg. But Utalii fought gamely and lost 0-1, thus forcing a penalty shootout which unfortunately they lost. This may yet be the best performance by a Kenyan side in the Africa champions league. After having finished second in the league in 2001, Oserian under Muhiddin qualified for the 2001 CAF confederations cup. In the first round, they easily dispatched Arabica Kirundo of Burundi, winning 2-1 away and 3-1 at home. In the second round, they faced a stern test against Etoile du Sahel of Tunisia. Oserian put on a solid performance. After losing the away leg 2-0, Oserian won the home leg 4-2 at Naivasha. However due to away goals rule, they were eliminated by the Tunisian outfit. It was a decent performance for a fully amateaur Oserian side against a professional Tunisian outfit. Etoile Du Sahel went on to reach the final of the Confederations cup that year where they lost on away goals rule. In the 2016 CAF confederations cup, Muhiddin will leadhis charges against FC St Eloi Lupopo of Congo DR. Muhiddin is confident. “I have to work hard to make past the second round because I know the first round I am through” said Muhiddin. Given his past record, do not count him out. Muhiddin has been called upon to coach the national team as coach or assistant coach on various occassions. Due to the shambolic manner in which the national team has been managed over the past 20 years, his record at national team has not been as stellar as it has been at club level. In 2004, he was the headcoach when the CECAFA senior challenge cup was held in Ethiopia. He took Kenya to the semi-finals where they lost to Ethiopia on penalties. In 2009, he took over from departing coach Antoine Hey as Kenya took on Nigeria in a world cup qualfier. Kenya played well but were undone by poor officiating. They went on to lose 2-3. A year later Kenya lost 0-1 to Guinea Bissau and Muhiddin resigned saying the FKF was not doing its part to enable the national team to prepare adequately for key assignments. Muhiddin was an assistant coach to Mohamed Kheri in 1989 when a very strong Harambee stars side qualified for the Africa nations cup. 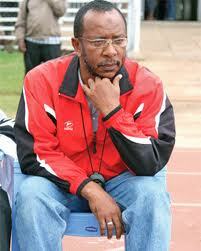 All things considered, Muhiddin is one of the best,perhaps the best local coach Kenya has produced. A mark of a great coach is the ability to take underdogs or previously unfancied teams to cup glory. This is something Muhiddin has accomplished throughout his career. This entry was posted in Kenya Football articles and profiles, Kenya Sports news and commentary and tagged Oserian Fastac, twahir muhiddin, Utalii FC. Bookmark the permalink.